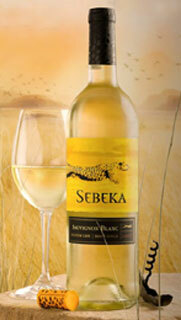 Our review: Golden yellow in color, this wine has aromas of apple and peach with pleasant citrus notes. Of moderate body on the palate, the fruit flavors are nicely balanced with an acidity that increases a bit into the finish, which is a little tart. Our rating: This is an example of a wine that is better than its price may otherwise suggest. The flavors are fresh and crisp, its overall balance good if not exactly complex. We had previously tasted this wine years ago (Sebeka Sauvignon Blanc 2006) and enjoyed it, so had some idea what to expect. Still, we think it represents a very good value for a versatile, food-friendly wine. We rate this vintage well Above Average. Taste profile from the winemaker: None for 2008, but from the 2007 vintage, "A bouquet of gooseberry, herbal notes, and bold tropical citrus flavors accented by subtle mineral notes, evoking rich soil undertones. With a refreshing, dry tang, its crisp taste, bright tropical fruit flavors, and satisfying texture pairs well with Asian and Indian cuisines."